Over the Easter weekend I had the opportunity to visit the Grand Canyon for the first time. The first views I had were literally breathtaking. I was stunned at the beauty of what I was seeing. Nearby, another man was having a similar experience, and describing it to his son. "Wow, isn't this incredible Aidan?" "Oh look the water! Aidan can you see the river way down there?" "Aidan, I think we should hike down. What do you think?" The kid, who appeared to be about 14, didn't respond. He was too busy gazing down at his phone. He heard nothing thanks to the headphones stuck in his ears. Grand Canyon be damned, that kid had more important stuff to do, like Snapchatting his bros and jammin' out to some Drake. While young Aidan doesn't technically qualify as a Millennial (the generation born in the 80s and 90s), he exhibits some behaviors often associated with them: too plugged in, self-centered, unable to communicate face-to-face. Like other traits discussed in our series on What Millennials Want (In the Workplace), there is a bit of truth to the stereotypes around Millennials and technology.Yes, Millennials are obsessed with their phones (83% of them sleep with their phones every night). 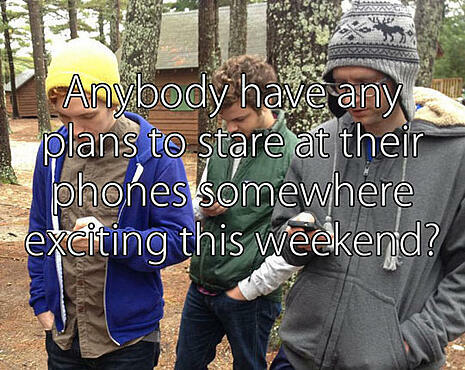 They do eschew face time for screen time. And they absolutely want constant access to their social sharing sites. The way this generation (now the largest in the American workplace) utilizes technology is fundamentally different from how traditional workplaces operate. But that isn't a bad thing. 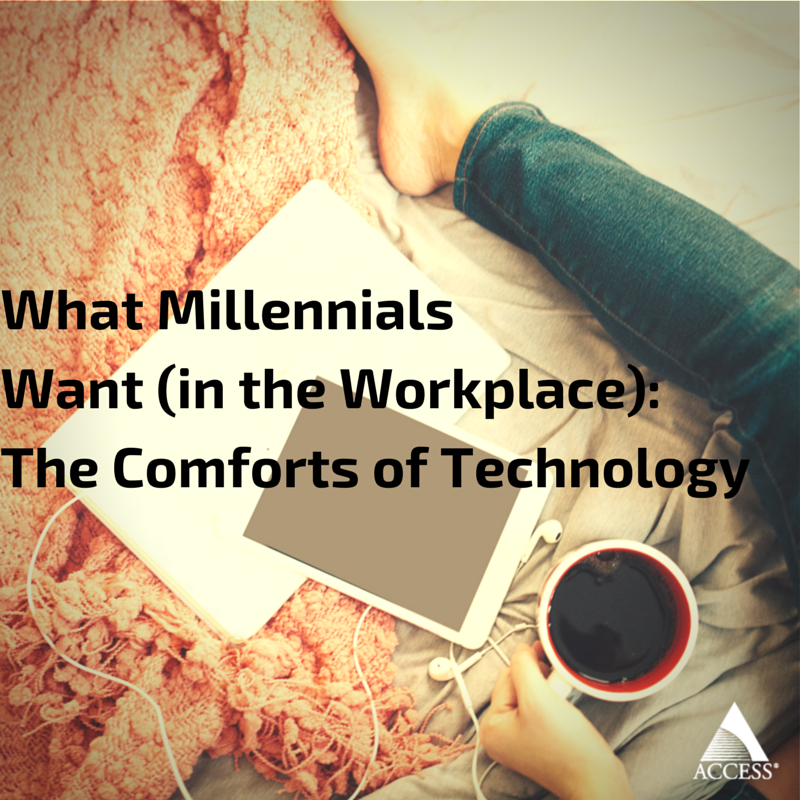 With the right policies and freedoms in place, Millennials and the technologies they prefer to use can usher in higher productivity and collaboration throughout the entire office, not to mention more positive online prominence for a business. It's important to remember that the youngest entrants into the workforce have always had access to the internet and mobile technology. Only the oldest Millennials even know the pain of dial-up internet (not to mention how many uses one can find for dozens of AOL discs). The technologies that are a convenience for everyone else are critical for them. That includes social media, texting, web conferencing, instant messaging, and remote working. It shows in the traits specific to the generation: connected, collaborative, enthusiastic, flexible, entrepreneurial. Each of these are either enabled or enhanced by modern technology. 78% of Millennials believe that access to technology makes them more effective at work. Of course, if it were up to Millennials, they wouldn't even be at work. Technology enables the blended work/life they prefer, hence why only 28% say their current employer is making full use of their skills. Those other 72% of workplaces would say they're trying to keep their younger workers focused and productive. As much as Millennials love being able to Skype into meetings (41% say they prefer to communicate electronically at work than face to face or even over the telephone), team camaraderie can suffer from a lack of actual face time. Plenty of Millennials have lost jobs due to improper use of social media networks, as well. As it stands, just 41% of companies have made changes to adjust to younger workers. When it comes to Millennials and technology in the workplace, think "guidelines" instead of "restrictions." Businesses that thrive today allow employees to take ownership of how they work, while maintaining a few traditional practices. Give them access to social media at work. There are positives of allowing social media access during working hours, including more prominence online, recruiting and office relationships (70% of employees have “friended” their managers and coworkers on Facebook). Trust adults to be adults and responsibly handle their duties while keeping an eye on Instagram, but advise them on the possible consequences of misuse. Bonus tip: emphasize LinkedIn, which is great for business but is also a hub of useful, entertaining content. Trust in BYOD policies. 86% of corporate employees use their personal smartphones to get work done, even outside business hours. It may make the IT department sweat, but a Bring Your Own Device policy will make Millennials more productive (and in their minds it'll feel like a corporate perk). Use technology that mirrors what they use personally. There is a lot of cool productivity technology that has popped up in recent years that will appeal to younger employees. Yammer, Slack, wikis, task managers (Todoist, Tick Tick), Evernote, hosted VoIP, even tablets - all of these enable productivity from anywhere, anytime. Keep some things sacred. There are quantifiable benefits to face-to-face communication, including better relationships and efficiency (20 emails usually equals a five minute conversation). Set a mandatory, regular in-person meeting with your team. Encourage employees to meet in person instead of emails or phone calls when possible. Considering only 54% of workers say they like the people they work with, everyone can benefit from better relationships. Some of these guidelines are major departures from traditional work policies, others are just loosening the reins a bit. Every office and occupation has different requirements, but the bottom line is being open to a changing workforce. The benefits? More engaged employees equals better engaged customers. Your employees will be less likely to tune out like young Aidan, but will instead utilize their technology for the benefit of the brand, themselves, and most importantly, your customers.